Built in the early 19th Century, Lough Bishop House nestles peacefully into a south-facing slope overlooking Bishop’s Lough. It’s unique location with breathtaking scenery in an unspoilt and tranquil setting, amid the rolling farmlands and lakes of Westmeath make it an ideal refuge from the hustle and bustle of modern life. Following extensive renovation this attractive Georgian country house offers its guests luxurious accommodation, peaceful surroundings and fine food much of which comes from our own farm, garden and orchard. A good night’s sleep is an essential part of any stay at Lough Bishop House and our comfortably furnished bedrooms ensure just that! 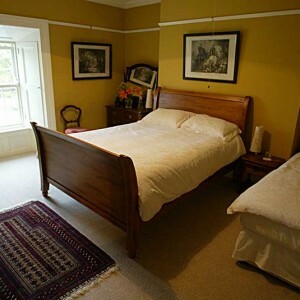 We have a choice of family, double or single rooms. All are spacious with fabulous views. Our guest bedrooms are all ensuite with power showers, and our family room has a bath as well. After a good night’s sleep, guests can avail of a hearty Irish breakfast and also enjoy our homemade breads and preserves. 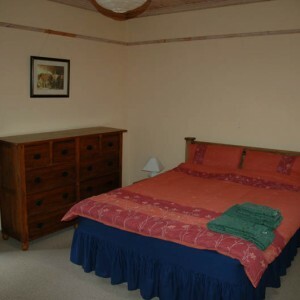 Situated in the yard behind the main house, Lough Bishop Self Catering Cottage is a one bedroom unit in the heart of the Westmeath countryside. Kitchen, dining and living area are open-plan and very spacious, fully equipped and tastefully furnished. Dublin Airport, Dublin and Dun Laoghaire ferry ports would be the nearest points of entry into the country. From Dublin take the N4 Sligo road to Mullingar. Stay on the by-pass and take the exit marked Castlepollard R394. Follow the R394 through Crookedwood, past Lough Derravaragh. Just after Garlandstown House which has white eagles at the entrance, turn right signed for Collinstown. Follow this road for 2 miles and take the 1st turn left signed for Castlepollard, 200 metres up this road take the 1st left again. We are a half a mile up this country lane on the left hand side. There is a sign at the gate. You cannot see the house from the road.